Old, outdated ideas and commonly held misconceptions surrounding nutrition can really hamper your progress. So here’s 4 protein myths that have been well and truly busted. The more popular health and fitness becomes, the more I see and hear misleading and false information about what constitutes good nutrition. Because of the rise in popularity of high protein diets, there has been a rise in the number of protein myths that exist. That guy in the gym isn’t probably the fitness guru he’s led you to believe. Not only will he tell you the only way to make gains by drinking 10 protein shakes per day. But he’ll also tell you to take them at specific times of the day. Undoubtedly down to the millisecond. And these protein myths aren’t limited to guys in the gym. Because even your nearest and dearest have an opinion. Just as you’re about to tuck into that nice juicy steak, they’ll tell you they’ve read an article saying eating red meat leads to heart attacks. And you’re likely to keel over and die if you take one bite from the meal in front of you. So where does that leave you? Confused and unable to tell the fact from the fiction? If so, read on as the 4 most popular protein myths get busted. This article covers everything from powders vs real food, right through to how much protein is too much. And also if a high protein diet really will lead to health problems. This one really comes down to personal preference. Hopefully, you won’t find a single fitness coach, personal trainer, or nutritionist prescribing a diet focused solely on 6 protein shakes a day. Although, sadly I’m sure those nutrition plans exist. Real food, particularly whole foods, are a great source of protein. And those lean meats, eggs, and fish have been bodybuilding staples for decades for a reason. Not only are they high in protein, but they are also abundant in micro nutrients, such as zinc, magnesium, and iron. Added to that, they taste pretty good too. And if you’re following a low calorie diet these foods will work in your favour. Because they will leave you with a fuller feeling for longer. And this helps you stick to your nutrition plan in the long run. But protein shakes can still have their place in a balanced diet. The main benefit of protein shakes is in their convenience. More often than not, a protein drink is far more palatable, easy to prepare and consume than a full steak dinner, straight after training. This is something I hear a lot. 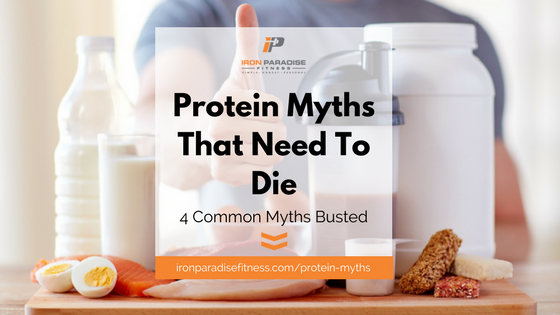 And in order to bust this protein myth we need to dig a little deeper into the science. Proteins are made up of of 21 amino acids. 9 of which are “essential amino acids”. And that means your body cannot produce them. Therefore, they have to come from the food you eat. When eaten, protein is broken down into its amino acids. And each of those amino acids is used by the body in a variety of ways. Additionally, you’ll often hear phrases like ‘complete protein’ and ‘high biological value’ when companies talk about their latest product. “And what does that mean?” I hear you shout. A complete protein contains all 9 essential amino acids. Most animal sources are complete proteins. Some plant proteins are complete, but more often than not several plant proteins need to be combined to get complete protein. Biological Value (or BV for short) is a measure of the quality of protein. And it denotes the percentage the protein that is incorporated into the proteins of the body. Foods are given a BV of between 0 – 100, with 100 indicating that a protein source is fully absorbed by the body. The higher the biological value, the more of a complete protein it is. Therefore, if a food is ‘complete’ and has a high BV then it’s a pretty good source of protein. So how is all this helping us debunk the myth that protein powder is better than regular food? Well, supplement companies and broscientist will tell you that whey is one of these foods that’s complete and with a high. And therefore, that makes it somehow magic and the reason you should be having double-digit shakes per day. BV becomes borderline irrelevant when you’re following a high protein diet with a wide array of protein sources. Because if your diet consists of fresh meat, fish, and eggs etc, your body is getting more than enough of the amino acids it needs to maximise protein synthesis. You don’t NEED protein shakes to maximise lean muscle development. My advice is to supplement with protein powder for the convenience factor, not because of its super high quality and mystical powers. Your main protein sources should come from real food. There’s nothing wrong with consuming protein shakes, but don’t be fooled by the marketing. Protein powder’s main benefit comes from its convenience. The answer to this one is simply no. Eating a diet high in protein is definitely the right way to gofor effective muscle growth and fat loss. But it’s sadly not the case that eating more and more protein will lead to more and more muscle growth. That’s a protein myth not based on any sound logic. There is a finite amount of protein that your body can synthesise during a single day. When your body has enough protein to satisfy protein synthesis (ie build muscle) any surplus protein will be oxidised and used for energy. The amount of protein the body is able to utilise for protein synthesis will vary from person to person. This is mainly dependant on body weight, body fat %, and activity levels. Therefore, it’s important to calculate your macros correctly, so you aren’t wasting calories on needless amounts of protein. Generally, eating 0.8g – 1g of protein per lb of bodyweight is generally considered to be the ideal amount. If you are in a calorie deficit then you can push this up to c. 1.2g / lb. Eating in excess of that amount won’t necessarily do you any harm, but I definitely won’t bring you exponentially more muscle mass. In fact, the only like result is a large hole in your wallet. Because let’s face, protein isn’t the cheapest of macros. And finally, if you’re counting calories then excessive protein consumption means you have to sacrifice calories from carbs and fat. Ultimately, this could effect your energy levels and potentially the quality of your workouts. Calculate your macros effectively and keep your protein intake high, but not excessive and at the expense of carbs and fat. Another one of the protein myths that is commonly pedalled in the media is that high protein diets have negative effects on your long-term health. Kidney damage and bone density issues being the main ones cited. So is this true? Is your high protein diet bad for your bones and internal organs? Let’s take a look at the myth and the facts. The argument posed is that the increased protein intake creates a strain on the kidneys. They will become overworked due to having to cope with the vast amounts of additional protein. But the reality is that your body is an amazing and wonderful machine and your kidneys are no exception. They can deal with filtering the entire amount of blood in your body around 20 – 25 times a day! In fact, half of one kidney is capable of doing the same amount of work as two kidneys together. So a little extra protein added to this process really is a drop in the ocean. Studies have also shown there is no evidence to suggest high protein diets result in kidney problems. The only time when a high protein diet should be avoided is when a pre-existing medical condition exists. In these cases, a doctor should always be consulted prior to making changes to your diet. This is a subject that’s very close to my heart, so I feel that I am in a unique position to comment on this. It is claimed that high protein diets increase the acid in your body. And it’s this increase that leads to the body releasing the calcium in the bones to combat it. Back in 2014, I suffered a broken hip, as a result of a bike accident. The break was partially caused by osteopenia in the spine and hip, which was previously undiagnosed. Since the accident, I’ve extensively studied the right approach to diet to correct my bone issue. As part of the recovery process I followed a high protein diet, supported by a heavy weight training programme. And having done that diligently for a number of years my bone density increased by more than 15%. This took 18 months and got my bones back in the ‘normal’ range. And that was versus the 3 years the doctors had estimated. This is just one person and in noway constitutes a scientific study. But it does back up the wider research out there of there being no link between a high protein diet and bone density. As long as your calcium intake is where it needs to be, there’s no need to be concerned. But, if you are worried, ensure your protein choices are high in calcium, ie milk and yogurt. Either that or supplement with calcium tablets. There’s no scientifically proven link between a high protein diet and long-term kidney and bone issues. Unless you have a prior condition, don’t let it worry you. Theories have existed for a number of years that consuming a high protein meal c. 20 minutes to an hour after training will dramatically increase protein synthesis. This is referred to as the ‘anabolic window’. And the belief is that this will optimise the work you’ve just put in the gym,. Ultimately, leading to more muscle growth. Right off the bat I’ll tell you now that I personally have a protein shake directly after my workout. However, this is not because I’m striving to hit the 20 minute sweet-spot. In fact, it’s more to do with training at 6am before breakfast. Therefore, consuming protein straight after my workout is beneficial, due to the fact my pre workout nutrition is limited. After all, who likes eating a ton of food first thing in the morning before exercise? All the evidence points to the ‘anabolic window’ being much longer than previously thought. Scientific research indicates that it’s more important to focus on the window between pre and post workout, and not just the post workout. In fact that window is c.3-4 hours wide. So if you were to train at 12pm for an hour, you might have your pre workout at 11am. Therefore, you’d have between 1pm – 3pm to have your post workout protein. Therefore, the consensus is that it is far more important to concentrate on your protein intake throughout the day, rather than worry about the 20 minute post-workout window. My advice would be to have a high protein meal a 1-2 hours before you train. And then follow that up with another high protein meal / shake 0-2 hours after you train. It’s up to you whether a protein shake before you hit the showers suits you best. The optimum time to consume protein is not confined to the 20 minutes after your workout. It’s far more important to make sure you’re eating enough protein throughout the day. Work out what works for you and go with that. Don’t sweat the small stuff. Protein is a fundamental part of your nutrition plan. Consume it in the right quantities on a daily basis and you will build muscle when bulking and prevent muscle loss when dieting. Protein timing is far less important and only needs to be considered when all other aspects of your nutrition are already optimised. Protein powders should mainly be used for their convenience and not to replace real foods. A high protein diet is not inherently dangerous for your long-term health. If you have a prior condition, seek medical advice first. Simon. Where can I get more information on nutrition?